I ordered it again because it was very well done and easy to use. This review is about item#68910756. The screw of the super trap is uniform and expensive, so it is difficult to obtain it. It does not interfere with the hole of the end cap, so it helps. As it is cheap and contains the number, it is good! This review is about item#29018344. If it goes to a screw shop, it is cheaper, but I think that it is a delivery including and a reasonable product at a reasonable price. This review is about item#5522483. (1) Price was low I thought that rust would occur, but there was no rust. 2 It is useful because it is quick to obtain after ordering. This review is about item#5522291. It is an ordinary Japanese quality, If you want to compare the ridiculous things that exist in the world It is a very good thing. This review is about item#68910284. We use when we fix cutter of semiautomatic packing machine. Thank you for the quality. Also, thank you. Ishijima Trading Co., Ltd. This review is about item#5522151. As the screw in the float chamber (+ pan head screw) did not come off, it was licked, so after OH it was changed to a stainless steel hex bolt. It was considerably cheaper than buying at a home improvement center, and there was no problem with quality. We are restoring 3 pieces of aluminum, but "iron" pierced bolt was rusting So I was looking for a replacement. The original parts are washers with the same dimensions as the head, but they were not available at Monotaro site. I also searched stainless steel washers as additional parts, but there were no products that matched. I chose the same "stainless steel" without a washer to try, but I am a little disappointed. This review is about item#5522657. The standard is the same as the default screw. I had to fix the arm from the opposite direction where the screw length of the product attachment is short due to the space problem of our desk, but I was able to cope with it enough. I was sorry without troubles such as returned goods. This review is about item#29029264. It was used for joining the flange surface. Although it can be seen as a washer and an integral type, this product was exactly just screws as it was a limited space. This review is about item#68910187. 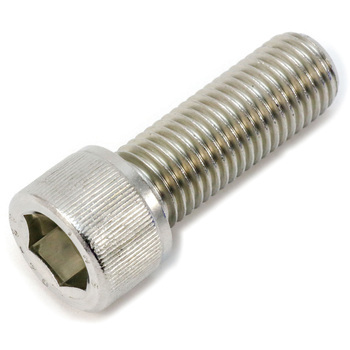 Remove the bolt of the rusted motorcycle and replace it with this bolt in a place where the hexagonal wrench is difficult to enter. I like it very much because it is very easy to maintain. This review is about item#05522483. I bought this hexagon socket head bolt so that I can not put a screwdriver because the space above the jig to screw it is narrow so that it can be tightened with an L-shaped hex wrench. It is convenient to fix it smoothly. This review is about item#5522203. There is no bolt of this size anywhere, so it is very helpful. Product has no problem at all. This review is about item#23431853. It is a solid product. It is perfect because the product size was detailed on the web part. Because occasionally it is wasted depending on the situation you use, such care is very helpful. This review is about item#5522833. The shape of the hexagonal hole is shallower by 6/100 mm compared with the screw of the maker who used so far, the screw head is gently recessed, I was worried about 2 points, It is said to be a different screw ". It seems better to avoid using it in a prominent place. Because it thinks that there is no problem functionally, it made it to three stars. This review is about item#68910485. Arrival was also fast, the screw part was also solid and I was able to use with confidence. This review is about item#5522307. Since there is no problem and it is fixed firmly, I use it with confidence. This review is about item#5522036. Can be used without problems. It is cheap and used frequently. This review is about item#5522133. There was no problem in quality. In case It was saved because the price was cheap and instant delivery. This review is about item#5522474. Kind of length many there is abundant, I am satisfied because the delivery time was also fast. This review is about item#05522343.